This article is about the mammal. For other uses, see Porcupine (disambiguation). Most porcupines are about 60–90 cm (25–36 in) long, with an 20–25 cm (8–10 in) long tail. [dubious – discuss] Weighing 5–16 kg (12–35 lb), they are rounded, large, and slow, and use aposematic strategy of defense. Porcupines occur in various shades of brown, gray, and white. 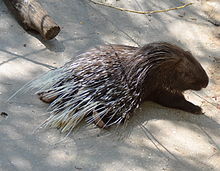 Porcupines' spiny protection resembles that of the unrelated erinaceomorph hedgehogs and Australian monotreme echidnas. Wikimedia Commons has media related to Erethizontidae.